BHS principal Bobby Ashley talks with Jason Lloyd about his and wife April Lloyd’s visit to the Democratic Republic of the Congo to ultimately adopt their son Samuel and bring him back to the United States. Through photos the Lloyds told teacher Candie Groves (right) and students in her French IV class how poverty-stricken the DNC is despite it being so wealthy in minerals and resources. Jason and April Lloyd hope the Blytheville High School students they talked to in December don’t have to endure what they did to keep their family together and ultimately get back to the United States. If any of them do have to overcome obstacles, however, chances are they will still believe what the Lloyds do: The prize was well worth the struggle. 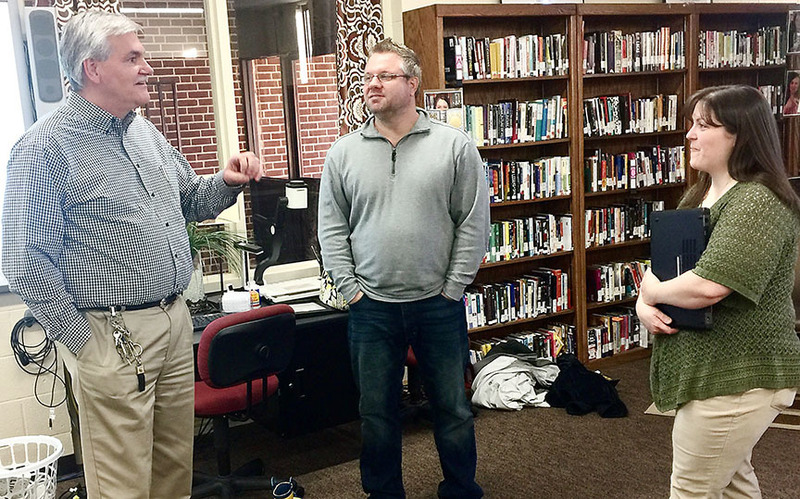 The Lloyds, owners of Soul Reflections Photography, recanted to the students and other guests on Dec. 1 at the BHS library the struggle to bring their adopted son Samuel back from the Democratic Republic of the Congo. However, diplomatic conflict with the American State Department caused the DRC to refrain from allowing the Lloyds to bring Samuel to the United States. So what should have been a relatively brief delay ended up being a four-year process before the family could finally be together. The Lloyds were invited to BHS by French IV teacher Candie Groves, whose students are learning about the oral history and traditions of French-speaking countries of Africa through original authentic fables, and then combining it with their own research about the present-day social, economic and political struggles that the people from each of the nations are facing. Jason Lloyd was featured last month by the Arts Council of Mississippi County for his “Telemana” photographs about his time in Kinshasa. “Telemana is the lingala word for “stand”; lingala is the native language of the DRC. The Lloyds embarked into what Jason said is known as the “heart of darkness.” Although the DRC is Africa’s richest country in minerals and resources, it is marred by historical and political scars which suppress the advancement of most of its citizens. In a July 2014 story by Shannon Spears Harris for The Courier News, the Lloyds first began investigating possibly adopting Samuel four years ago, but only this fall were they allowed to legally adopt him and take him from Kinshasha, the urban capital of the DRC, back to Dyersburg, Tenn. While Jason Lloyd stated that he would gladly “pay that price again” to have Samuel reunited with them, he didn’t have much good to say about Kinshasha, and even less about the diplomatic processes that caused his family so much pain. Groves had hoped her students would find something that they could take away from the Lloyds’ presentation, “and I was definitely not disappointed. “They were on the edge of their seats and full of questions for the Lloyds,” she stated. “And still, the students cannot stop talking about the insightful photos they saw and the stories they heard about everyday life in the Congo. This experience has really enhanced their understanding about their research on the other French-speaking African countries." April Lloyd told the students that after waiting for months for the Congolese Government to approve the adoption, the issuance of adoption letters for children being adopted by U.S. families had been shut down and their plans were put on hold indefinitely. “We decided not to bring any undo attention to the situation because we didn’t want to offend the Congolese Government, but after several months of inaction we began to do whatever we could to bring the issue to light,” April said. BHS student Brianna Dunham summed up everything about the Lloyds in one statement. ”I never knew how lucky we have it until I saw the pictures they took in the Congo of the different struggles they have,” she said.